One week ago, PaySimplers hit the streets of Denver to celebrate the Rockies home opener. 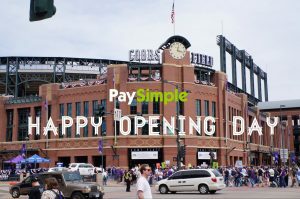 In the spirit of rooting for the home team, we decided to give Colorado business owners a Home Field Advantage – 50% off their first three months of PaySimple through the end of April. What better time than Opening Day to spread the news? We spent the day passing out free peanuts, rubbing elbows with our fellow Coloradans, and joining in the general hoopla. We had a blast. For a few PaySimple team members, it was a first-time experience seeing LoDo in its Opening Day glory. They were blown away by the energy and crowds, in what is typically a pretty mild downtown atmosphere. We made new friends, heard “PaySimple” murmured amongst the game day crowds, and felt an overwhelming sense of community and belonging. It was a Colorado kind of day. We want to share some of our favorite moments with you – the good, the best, and…the downright weird.